This application protocol is based on a scientific poster that can be accessed under "Resources" in the Protocol tab. In this application protocol, we describe a rapid protocol for the dissociation of neonatal mouse or rat hearts followed by the efficient immunomagnetic enrichment of cardiomyocytes, cardiac fibroblasts, and endothelial cells. PBE buffer: Prepare a solution containing PBS, pH 7.4, 0.5% bovine serum albumin (BSA), and 2 mM EDTA by diluting MACS® BSA Stock Solution (# 130‑091‑376) 1:20 with autoMACS® Rinsing Solution (# 130‑091‑222). Degas buffer before use and keep cold (2−8 °C). ▲ Note: Always use freshly prepared buffer. Do not use autoMACS Running Buffer or MACSQuant® Running Buffer as they contain a small amount of sodium azide that could affect the results. ▲ Note: EDTA can be replaced by other supplements such as anticoagulant citrate dextrose formula-A (ACD-A) or citrate phosphate dextrose (CPD). BSA can be replaced by other proteins such as mouse or rat serum albumin, mouse or rat serum, or FBS. Buffers or media containing Ca2+ or Mg2+ are not recommended for use. PB buffer for isolation of cardiac endothelial cells: Prepare a solution containing phosphate-buffered saline (PBS), pH 7.2 and 0.5% bovine serum albumin (BSA). Keep buffer cold (2−8 °C). Degas buffer before use, as air bubbles could block the column. ▲ Note: Always use freshly prepared buffer. Do not use autoMACS Running Buffer or MACSQuant Running Buffer as they contain a small amount of sodium azide that could affect the results. ▲ Note: Addition of DNase (230 U/mL) to the buffer is optional, but may improve plating of endothelial cells after cell separation. ▲ Note: BSA can be replaced by other proteins such as mouse serum albumin, mouse serum, or fetal bovine serum (FBS). Buffers or media containing Ca2+ or Mg2+ are not recommended for use. (Optional) Fluorochrome-conjugated antibodies for flow cytometry analysis, e.g., Anti-α-Actinin (Sarcomeric)-FITC (# 130-106-936), Anti-Cardiac Troponin T-FITC (# 130-106- 687), Anti-Myosin Heavy Chain-VioBlue® (# 130-106-252), Anti-MLC2a-PE (# 130-106-142), or Anti-MLC2v-APC (# 130- 106-134). Learn more about our antibodies and dyes. MACS Columns and MACS Separators: The recommended columns for optimal purity and recovery are listed in the table below. Depletion can also be performed using the autoMACS Pro Separator (mouse) or the MultiMACS™ Cell24 Separator (rat). ▲ Note: Column adapters are required to insert certain columns into the VarioMACS™ or SuperMACS™ II Separators. For details refer to the respective MACS® Separator data sheet. (Optional) Labeling Check Reagent-PE (# 130-095-228) or fluorochrome-conjugated antibodies for flow cytometry analysis, e.g., Anti-CD90.2-APC (# 130-091-790) or CD31-PE (# 130-097-422). Learn more about our antibodies and dyes. (Optional) Propidium Iodide Solution (# 130-093-233) or 7-AAD for flow cytometry exclusion of dead cells. MACS Columns and MACS Separators: The recommended columns for optimal purity and recovery are listed in the table below. Separation can also be performed using the autoMACS Pro or the autoMACS Separator. ▲ Note: Column adapters are required to insert certain columns into the VarioMACS or SuperMACS II Separators. For details refer to the respective MACS Separator data sheet. 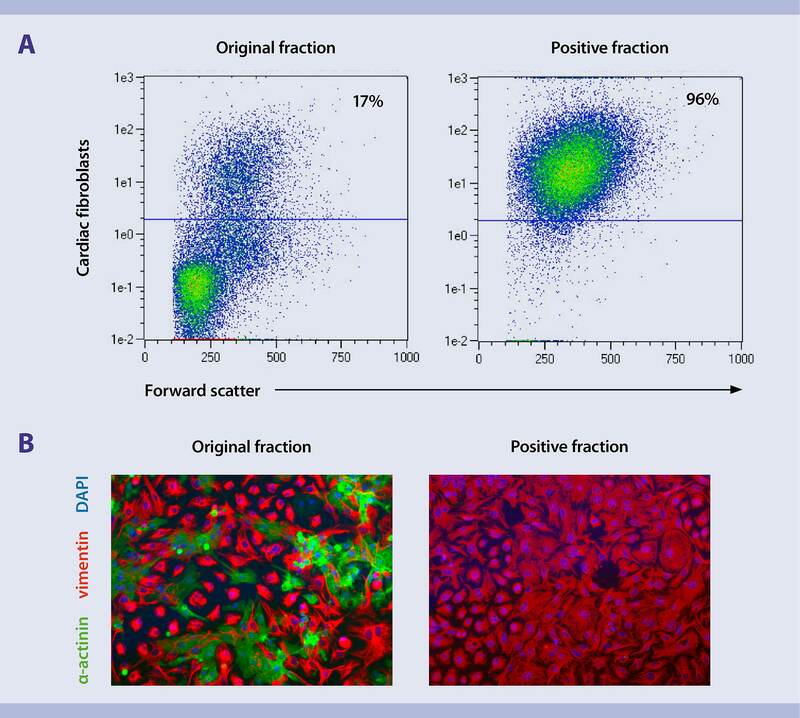 (Optional) Fluorochrome-conjugated antibodies for flow cytometry analysis, e.g., Anti-CD90.2-APC (# 130-091-790), CD31-PE (# 130-097-422), CD90.1-PE (# 130-102-636) or CD31‑APC (# 130-105-937). Learn more about our antibodies and dyes. MACS Columns and MACS Separators: The recommended columns for optimal purity and recovery are listed in the table below. Separation in mouse tissue can also be performed using the autoMACS Pro or the autoMACS Separator. Dissociate neonatal heart tissue from mouse or rat with the Neonatal Heart Dissociation Kit. This kit enables enzymatic tissue dissociation followed by semi-automated mechanical tissue dissociation on the gentleMACS™ Dissociator. Follow the protocol of the kit data sheet. Rapid dissociation of neonatal heart tissue results in high yields of single heart cells. 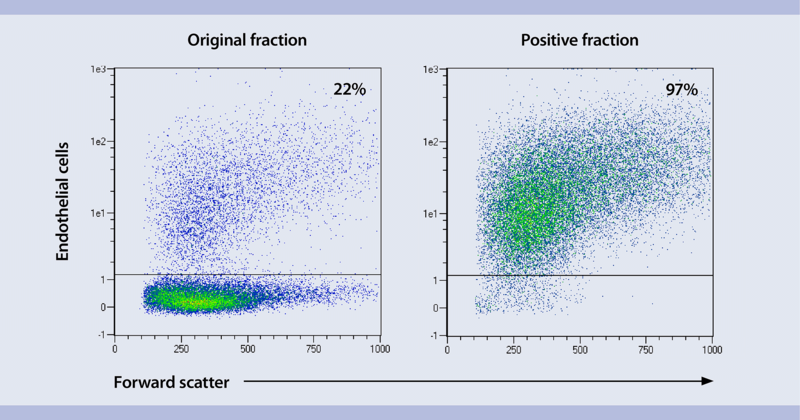 Flow cytometric analysis of noenatal heart tissue dissociated with the Neonatal Heart Dissociation Kit shows high yields of single cells with excellent viability and a high percentage of alpha-actinin-positive cardiomyocytes, as well as vimentin-positive non-myocytes. Flow cytometric analysis of noenatal heart tissue dissociated with the Neonatal Heart Dissociation Kit shows high yields of single cells with excellent viability and a high percentage of alpha-actinin-positive cardiomyocytes as well as vimentin-positive non-myocytes. Use the Neonatal Cardiomyocyte Isolation Kit to enrich cardiomyocytes by depleting non-target cells. The kit contains a cocktail of monoclonal antibodies conjugated with MACS® MicroBeads that magnetically label non-target cells, which can then be depleted by retaining them within a MACS Column in the magnetic field of a MACS Separator, while the unlabeled cardiomyocytes pass through the column. Follow the protocol of the kit data sheet. Efficient isolation of cardiomyocytes by depleting non-target cells. Depletion of non-myocytes efficiently isolated cardiomyocytes with purities of up to 98% (top). Cultures of enriched cardiomyocytes showed synchronous beating activity and expressed sarcomeric proteins (alpha-actinin) in a cross-striated pattern. 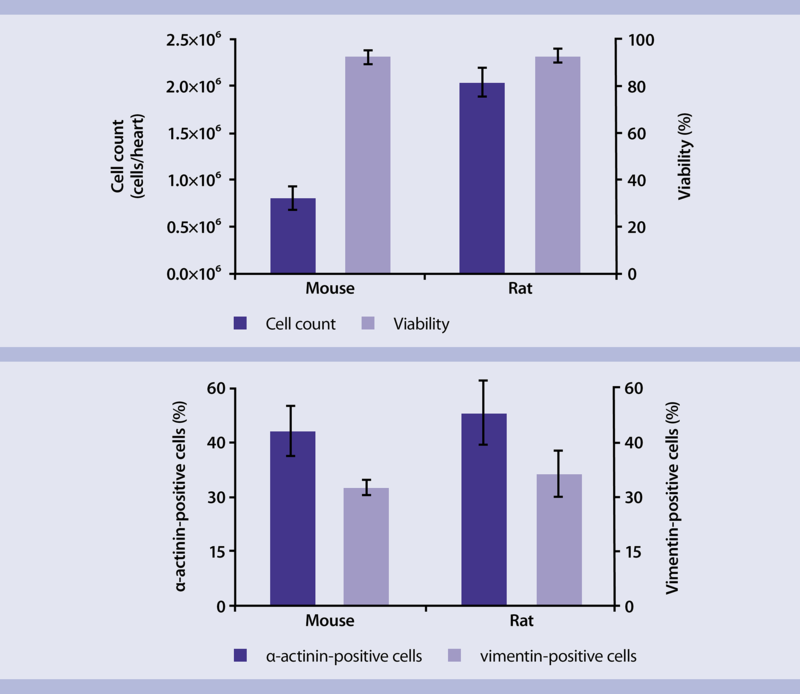 Vimentin-positive non-myocytes were just barely detectable (bottom). 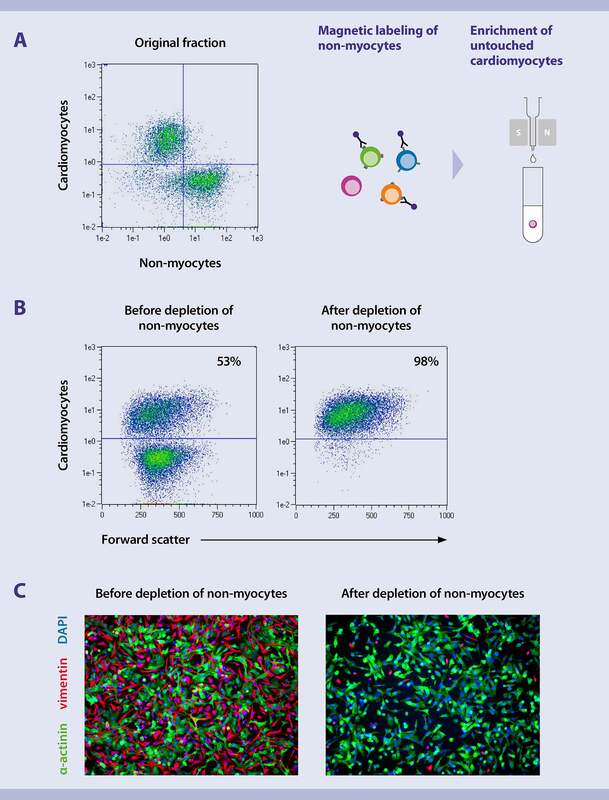 Depletion of non-myocytes efficiently isolated cardiomyocytes with purities of up to 98% (top). Cultures of enriched cardiomyocytes showed synchronous beating activity and expressed sarcomeric proteins (alpha-actinin) in a cross-striated pattern. Vimentin-positive non-myocytes were just barely detectable (bottom). Use the Neonatal Cardiac Fibroblast Isolation Kit to enrich fibroblast cells in a two-step process that first labels and depletes non-fibroblast cells, and then selects fibroblast cells for elution. Follow the protocol of the kit data sheet. Efficient isolation results in high-purity cardiac fibroblast populations. Enrichment with the Neonatal Cardiac Fibroblast Isolation Kit resulted in cardiac fibroblast populations with purities of up to 96% (top). Immunofluorescent staining of enriched and subsequently plated cardiac fibroblasts showed homogenous expression of vimentin with virtually no contaminations of alpha-actinin-positive cardiomyocytes (bottom). Efficient isolation results in high-purity cardiac fibroblast populations. Enrichment with the Neonatal Cardiac Fibroblast Isolation Kit resulted in cardiac fibroblast populations with purities of up to 96% (top). Immunofluorescent staining of enriched and subsequently plated cardiac fibroblasts showed homogenous expression of vimentin with virtually no contaminations of alpha-actinin-positive cardiomyocytes (bottom). Highly enriched endothelial cell populations are a prerequisite to facilitate vascularization in tissue-engineered myocardium. Isolate cardiac endothelial cells from dissociated neonatal heart tissue with the Neonatal Cardiac Endothelial Cell Isolation Kit. The kit enables a two-step process that first labels and depletes non-endothelial cells, and then selects and retains endothelial cells in the column for subsequent elution. Follow the protocol of the kit data sheet. Efficient isolation of cardiac endothelial cells from dissociated neonatal heart tissue. Immunomagnetic isolation of endothelial cells from dissociated neonatal hearts using the Neonatal Cardiac Endothelial Cell Isolation Kit generates endothelial cell populations with purities of up to 97%. Immunomagnetic isolation of endothelial cells from dissociated neonatal hearts using the Neonatal Cardiac Endothelial Cell Isolation Kit generates endothelial cell populations with purities of up to 97%. Kernbach, M. et al. Rapid heart dissociation and subsequent purification of heart cells for cardiac tissue engineering.